Renesas Electronics Corporation (TSE: 6723), a premier supplier of advanced semiconductor solutions, today introduced a new design environment for its powerful RZ/A1 microprocessors (MPUs) to simplify and accelerate the development of rich human-machine interface- (HMI) and camera- and GUI-based applications, such as industrial equipment, building controls, home automation, medical devices, white goods, and video surveillance and video/fingerprint based access control. Featuring the new RZ/A1 Software Package, the integrated design environment offers a complete starting point for RZ/A1-based HMI and camera-GUI design, significantly reducing the complexity and resources required to develop these applications. The RZ/A1 Software package incorporates familiar and easy-to-use design characteristics of the microcontroller (MCU) design environment to ease the transition path for designers who are migrating to a rich and more complex MPU design environment. The growing popularity of HMI-based systems and other markets where HMI and streaming converge is driving the need for higher-end MPU implementations that can manage the demands of these rich and highly sophisticated systems. Renesas’ high-performance RZ/A1 MPUs features the ease of use of Renesas MCUs along with up to 10MB of on-chip SRAM, a built-in memory management unit, and a powerful Arm® Cortex®-A9 core. This combination allows engineers to keep the application design process simple and fast, while they take advantage of computational and HMI capabilities of high-speed MPUs. 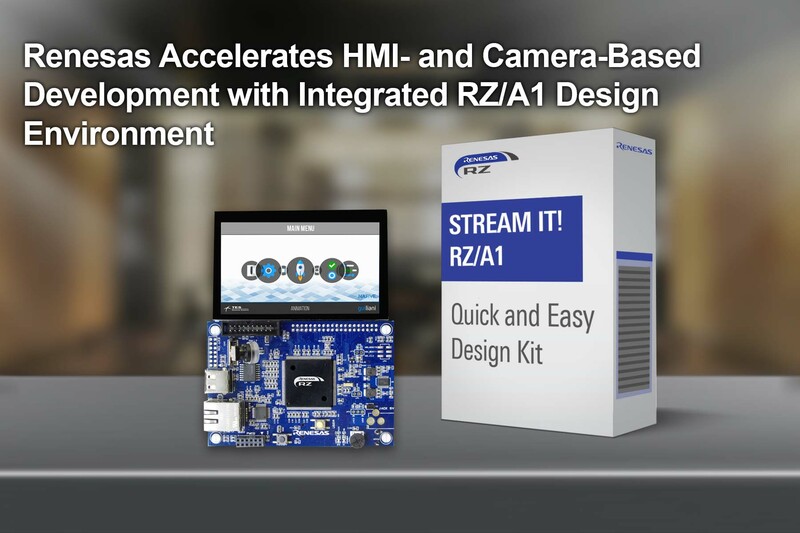 Software engineers working with streaming applications, such as IP-based video and radio streams, as well as video surveillance and video/fingerprint-based access control, can use the RZ/A1 Software Package together with the Renesas RZ development kit to further reduce development times. This out-of-the-box evaluation and development platform allows engineers to begin their specific code development almost immediately after installing the project and opening the tool suite. Eliminating the typical software integration tasks allows engineers to focus their time and resources on developing compelling HMI-based applications. In addition to the software quick start, the RZ/A1 MPUs and the RZ/A1 Software Package offer a streamlined PCB layout with quad flat packaging (QFP) and easy power and clock design, as well as a familiar debugging and development experience for designers migrating from MCU to MPU environments. XIP (Execute-in-Place) Linux with QSPI flash memory allows the RZ/A1 Series to add MCU-like boot-up times to the MPU-level performance. The hardware integration enables customers to spin up their custom designs quickly, minimize implementation errors and other design risks, eliminate the need for external DRAM, deliver boot up response times similar to MCUs, and reduce overall bill-of-materials costs. The RZ/A1 Software Package is compatible with the IAR System® IAR Embedded Workbench®, as well as with Renesas’ e² studio Eclipse-based development environment. The RZ/A1 Software Package is available now pre-integrated with the RZ/A1 MPUs and is also available for use with the RZ development kit. For more information, view here. (Remarks) Arm and Arm Cortex are registered trademarks of Arm Limited in the EU and other countries. IAR Systems and IAR Embedded Workbench are trademarks or registered trademarks owned by IAR Systems AB. All other product names are trademarks of their respective owners.